Tara McKelvey, a 2011 Guggenheim fellow, is the author of Monstering: Inside America’s Policy of Secret Interrogations and Torture in the Terror War. She writes frequently for The New York Times Book Review. 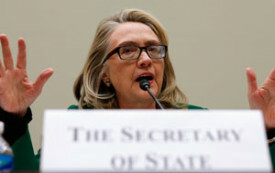 She vowed to make women’s rights a cornerstone of US foreign policy. How did she do? The privatization of veterans' healthcare limits the government's ability to honor those who serve. Defenders of torture dwell not only in the White House and Pentagon, but in the halls of academia. When prominent law professors and academics cite the fantastic "ticking-bomb theory," they not only spread misinformation and foster a perpetual state of fear, but they use their credentials to legitimize a culture of torture. "Do what has to be done" is the motto of the investigative arm of the US military. But when the understaffed institution regularly loses evidence and delays autopsies, it does too little. When it attempts to protect evidence by detaining witnesses, it does too much. A look at the inherently flawed investigations of detainees.